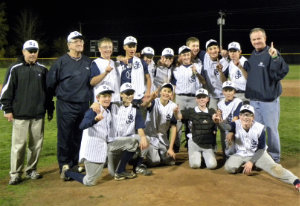 Baseball (boys): Runs from September through October for boys in Grades 6-8. Basketball (girls): Runs from December through February for girls in Grades 7-8 and Junior Varsity team for grades 5-6. Basketball (boys): Runs from December through February. Varsity team for grades 7-8 and Junior Varsity team for grades 5-6. Soccer (co-ed): Runs May to June for boys and girls in Grades 7-8. Hockey (co-ed): Runs from December through February for boys and girls. Varsity team for Grades 6-8 & Junior Varsity team for Grades 3-5. Softball (girls): Runs from April through May for girls in Grades 6-8. 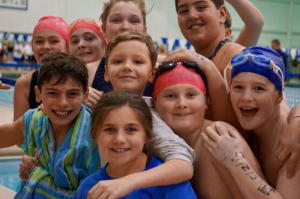 Swim Team (co-ed): Runs from September through December for boys and girls in Grades K-8. Track (co-ed): Training begins in May for boys and girls in Grades 3-8 and students participate in the Diocesan Track Meet. Volleyball (girls): Runs from September through October for girls in Grades 7-8. Volleyball (boys): Runs from March through May for boys in Grades 7-8. Ski Club: Winter season at Kissing Bridge (season subject to weather availability); open to various grade levels; non-Diocesan. Instructional clinics for soccer and baseball prior to season based on interest and participation. St. John's parents have organized to provide athletic opportunities for students from Pre-K to 8. The SJPAA was formed to administer and run all non-school sports teams at St. John’s. SJPAA sponsors teams that are open to all children of parishioners and participates in the Town of Tonawanda recreational sports leagues. Information for these programs is distributed through our school, as well as St. John’s Religious Education programs and the weekly bulletin distributed after Masses. You may also contact the rectory at (716) 873-1122 for more information, as well. Adult Basketball: Winter season for ages 20-60 (men) on Tuesday evenings. 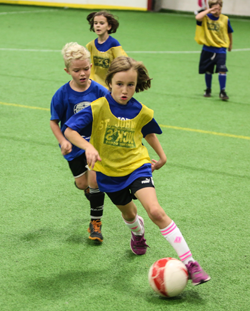 Indoor Soccer: Spring and fall seasons affiliated with Town of Tonawanda; open to Grades K - 8; non-Diocesan provided through the St. John's Parent Athletic Association (SJPAA). Baseball: Summer season affiliated with Town of Tonawanda; open to ages 7 & up; non-Diocesan; team subject to interest and participation. Softball: Summer season affiliated with Town of Tonawanda; open to ages 7 & up; non-Diocesan; team subject to interest and participation. T-Ball: Summer season affiliated with Town of Tonawanda; open to ages 7 & up; non-Diocesan; team subject to interest and participation.